RENAUD D’AVÈNE DES MÉLOIZES, ANGÉLIQUE (baptized Angélique-Geneviève) (Péan), b. 11 Dec. 1722 at Quebec, daughter of Nicolas-Marie Renaud* d’Avène Des Méloizes and Angélique Chartier de Lotbinière; d. 1 Dec. 1792 at Blois, France. Almost nothing is known about Angélique Renaud d’Avène Des Méloizes’ childhood and youth. A list of pupils attending the Ursuline boarding school between 1700 and 1739 includes her name; the institution’s annalist later made a note: “The famous Dame Péan, wife of the Chevalier de Livaudière [Michel-Jean-Hugues Péan]. She was remarkable for her beauty, her charms, and her wit.” The portraits of Angélique certainly give her an expression of confidence that makes her beautiful; the rather sharp nose suggests a strong will, as do her bright, piercing eyes and equally resolute chin. 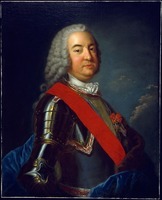 On 3 Jan. 1746 Angélique married Michel-Jean-Hugues Péan, adjutant at Quebec. All the husband’s talents “lay in his wife’s charms,” the anonymous author of the “Mémoire du Canada” commented irreverently. Péan would soon, however, enjoy high rank in Quebec society, when he became the confidential agent of Intendant Bigot. The couple lived in the Upper Town, where “after the intendant’s house, the best one in town is M. Péan’s. . . . All the elegant people meet at his house, and here life is carried on after the fashion of Paris.” The hostess was young, engaging, witty, rather gentle and obliging; her conversation was lively and amusing. Contemporary accounts add that as mediator and protectress for her relatives and friends she was adroit, and that people unfailingly paid court to the two Péans. After the capitulation of Montreal, Angélique accompanied Bigot and her husband to France, sailing on the Fanny in September 1760. There had already been gossip in France about the scandal of their relationship. Soon accusations were levelled against the triumvirate of Bigot, Péan, and Joseph-Michel Cadet, who were held responsible for the bad administration and loss of Canada. Angélique’s husband was arrested in November 1761 and kept in solitary confinement in the Bastille. 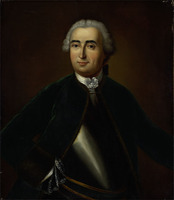 Mme Péan nevertheless attempted to establish a clandestine correspondence with him, and even obtained permission from the minister, Choiseul, to see him; from March to June 1764 when he was released, she visited him 58 times. The Péans then went to live at Orzain, near Blois, on property Péan had purchased upon arrival in France in 1758, and for a time they continued their worldly existence. Mme Péan, who was to lose her husband in 1782, devoted the last 20 years of her life to the impoverished, and especially to the Canadian families who had settled in Touraine. Her only daughter, Angélique-Renée-Françoise, married Louis-Michel de Marconnay on I Sept. 1769; they had no children. Mme Péan died on 1 Dec. 1792, at nearly 70 years of age. Angélique Renaud d’Avène Des Méloizes, who was extravagantly admired by the highest officials in the colony, was clearly a formidable woman. Those who liked her did not dare to say much about her. There is no argument in her defence or strong praise in the surviving documents of the period. Only Sieur de Courville [Aumasson], the memorialist, expressed a desire that we look at the other side of the coin “and see that she had a great deal of merit, above all for her charitable temperament.” This controversial figure was made the heroine of William Kirby*’s famous novel, The golden dog (New York, 1877), in which fiction takes over from historical truth. AD, Loir-et-Cher (Blois), État civil, Blois, 1er, déc. 1792. “Les archives de la famille Gradis et le Canada,” Claude de Bonnault, édit., ANQ Rapport, 1944–45, 273. Coll. des manuscrits de Lévis (Casgrain), VI, 115; VII, 219; IX, 105. Doreil, “Lettres” (A. Roy) ANQ Rapport, 1944–45, 158. “Mémoire du Canada,” ANQ Rapport, 1924–25, 117–18, 188–89. Burke. Les ursulines de Québec (1863–66), II, 176. H.-R. Casgrain, Guerre du Canada, 1756-1760; Montcalm et Lévis (2v., Québec, 1891; réimpr., Tours, France, 1899). Frégault, François Bigot. P.-G. Roy, La ville de Québec sous le Régime français (2v., Québec, 1930), II, 266. Ægidius Fauteux, “Le S. . . de C. . . enfin démasqué,” Cahiers des Dix, 5 (1940), 267–68. Juliette Rémillard, “Angélique Des Méloizes,” RHAF, XIX (1965–66), 513–34. Juliette Rémillard, “RENAUD D’AVÈNE DES MÉLOIZES, ANGÉLIQUE,” in Dictionary of Canadian Biography, vol. 4, University of Toronto/Université Laval, 2003–, accessed April 24, 2019, http://www.biographi.ca/en/bio/renaud_d_avene_des_meloizes_angelique_4E.html.